The first Boston Conference on Cybersecurity for Secondary School Administrators was held at BC High on Thursday, January 24, 2019. 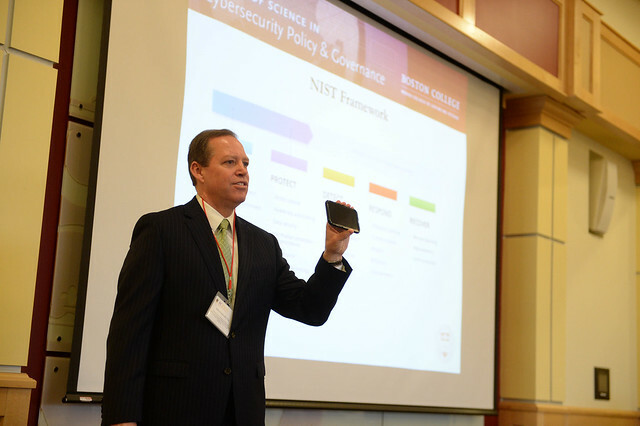 The conference, conducted in partnership with MIS Alliance of Newton, MA, assembled preeminent experts and leaders in the field of cybersecurity. Speakers included Kevin Powers '85, P'16, Director, M.S. Cybersecurity Policy and Governance, Carroll School of Management at Boston College and Margaret Paget, Partner of Kurker Paget LLC. In addition, FBI Cyber Analysts provided a live demonstration of e-mail spoofing, dark web research, and social media exploits that impact educators and students. Vendors including Datto, SonicWall, and Aruba were also in attendance to share the latest advances in IT security. The FBI’s hands-on demonstration represents the key initiative to not just educate school administrators, but also empower them through an understanding of their obligations and potential mitigation strategies. The phrase “not if, but when” is often used in the realm of cybersecurity, and Margaret Paget spoke to the actions that educational institutions can take to meet their legal obligations and develop best practices in the face of impending threats. Kevin Powers drove home the point that cybersecurity is not just a technical issue, but a risk management issue that needs to be addressed just like any other business risk. The benefits of investing in infrastructure and employee training as compared with the potential financial cost of breaches and hacks, legal liability, and damage to reputation make the synergy between school administration and IT departments more critical than ever. In addition to focusing on institutional responsibilities and threats, the conference was an opportunity for thought leaders to celebrate positive cybersecurity. Networking between guests started a discussion on ways schools can expose students to careers in cybersecurity and shape the next generation of leaders in this important field.